The 2013 Ward’s Auto 10 Best Engines feature 5 engines that were on the list last year (and years prior, in some cases) along with five engines that are new to the Ward’s 10 best list. Interestingly, what you will not see on the 2013 10 best engine list is any hint of hybrid or electric drivetrains as the judges at Ward’s seemed to lean in favor of performance engines this year over fuel sipping alternative power vehicles. The Ward’s judges spent a few months driving 40 different vehicles, scoring them on power, technology, observed fuel economy and noise, vibration and harshness characteristics – with only those models that carry an MSRP below $55,000 eligible for the major award. Included in this list are three European engines, 4 American engines and 3 Japanese powerplants with 6 of the engines featuring forced induction while the other 4 are naturally aspirated. Finally, the list is comprised of 5 4-cylinder engines (4 inline, 1 Boxer), 4 6-cylinder engines (3 V6, 1 inline 6) and a single V8. "We're always excited to see the advancements being made in hybrids and all-electric vehicles," says Drew Winter, editor-in-chief of WardsAuto World magazine. "But there are still significant barriers for the average consumer to look past when considering these vehicles. The cost for most of them remains high, and the driving ranges of the battery electric vehicles will have to be extended to meet the needs of most people." 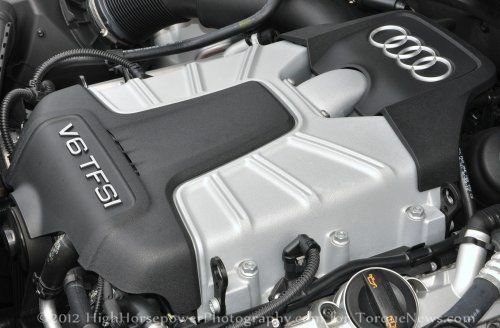 First off, those engines that are returning for 2013 to the Ward’s 10 best engines list are the 3.0L supercharged Audi V6 from the S5, the 2.0L turbocharged 4-cylinder from the BMW 328i and the 30.L turbocharged inline-6 engine from the BMW 135is, the 3.6L Pentastar V6 from the 2013 Ram 1500 and the 2.0L EcoBoost 4-cylinder from the Ford Focus ST and the Ford Taurus. The supercharged Audi 3.0L is on the list for the 4th straight year while the turbocharged N55 I6 from the BMW 135is and Chrysler’s Pentastar V6 are both hit the Ward’s best list for the 3rd year in a row. BMW’s 2.0L turbocharged mill from the new 328i and the 2.0L EcoBoost 4-cylinder from Ford’s Focus ST are both on the list for the second year in a row. The newcomers to the 2013 Ward’s 10 Best Engines list begin with the 662 horsepower 5.8L supercharged V8 from the 2013 Shelby GT500 Mustang that makes this new super-Stang the fastest and most powerful American muscle car ever sold in dealerships. This is also the third straight year that Ward’s has honored a Ford Mustang V8, with the Mustang Boss 302 5.0 making the list in 2012 while the standard Mustang GT took the title in 2011 (Click here for a closer look at the Ford engines honored in the 2013 awards). This monster V8 is joined by the 2.0L turbocharged 4-cylinder mill from the new Cadillac ATS, the 2.4L 4-cylinder from the Honda Accord Sport, the 3.5L V6 from the Honda Accord and the 2.0L Boxer 4-cylinder that is available in both the Subaru BRZ and the Scion FR-S. For American Honda, this is the first time that they have cracked the Ward’s 10 Best Engines list since 2009 while the inclusion of the Subaru Boxer motor in the BRZ and FR-S marks the first time that a Subaru or Toyota engine has made the list since 2010.